I’ve not long got back from the Bristol Sound & Vision show where I found two principle themes, two dominant product development types, two pathways which are now well trodden by the majority of the hi-fi industry: the active/powered speaker and the all-in-one system. All-in-one systems come in all shapes and sizes and offer a selection of features from a larger menu. Some people will offer a CD player and others will not, for example. This mixing and matching of options is producing a welcome choice for the user. The Norwegian company’s Rena SA-1 is yet another take on the popular theme as it gives you a small footprint, streaming device packed with useful features. Electrocompaniet has been busy developing a small family of networkable products including the Tana SL-1 wireless speaker and streamer, the associated L-1 speaker and two Rena streamers. The Rena S-1 is a wireless streamer that you can add to a hi-fi. The Rena SA-1 seen here includes an amplifier which allows you to add a pair of speakers to get underway. In fact, the SA-1 offers a 75W class D amplifier but, at first glance, not much else. This relatively little box spans a meagre 180 x 180 x 49mm, weighs 1.6kg and appears to provide no controls at all. Once powered up, there are illuminated touch controls for power and volume, though. All the main action happens around the back, it seems. There’s a power socket for a 34V off board supply with a separate IEC cable connection. Next to that is a LAN socket to achieve a wired connection, S/PDIF input and output, optical input, USB, Line output and speaker connectors. You can connect the unit to wireless speakers with a stream up to 24bit/96kHz. 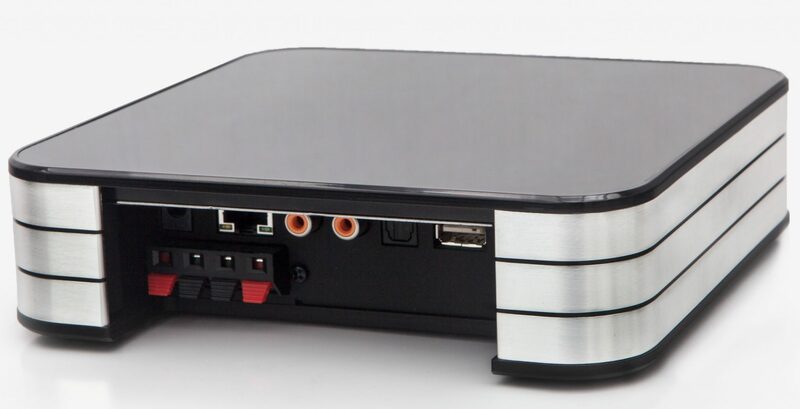 What you don’t see inside this stylish chassis that resembles a large Rennie tablet is a DAC supporting up to 24bit/192kHz and up to DSD 128. Airplay is supported but not Bluetooth (a seemingly poor decision methinks considering user expectations for this price point). A host of services are featured such as Spotify Connect, Tidal and Qobuz. There’s no physical remote with the SA-1 but you do have free use of an Electrocompaniet app for iOS and Android. Electrocompaniet is a firmly audiophile company. I’m used to this name being associated with £6k power amps and £20k speakers. The top of the outer RA-1 box container displays the sub-brand ‘EC Living’ but it also plasters Electrocompaniet underneath, clearly. The front of the Rena SA-1 chassis also displays the name, Electrocompaniet. ‘EC Living’ is only seen under the rear lip of the chassis (see below). 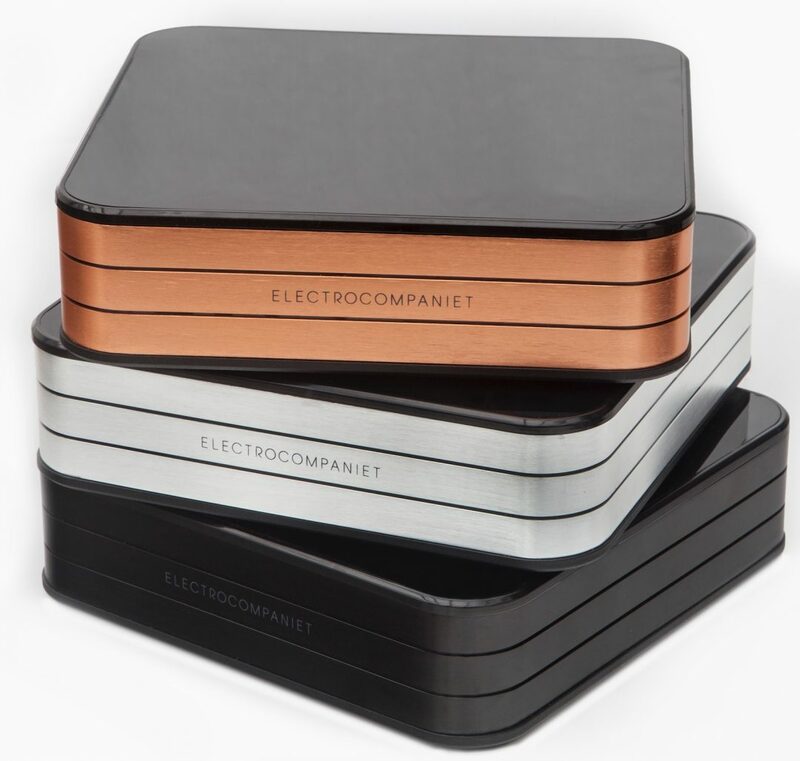 When faced with the Electrocompaniet brand, I have a high level of expectation in terms of what I expect to see in terms of basic components, quality and performance. I would love to know then, why Electrocompaniet has associated its respected name with cheap and nasty spring-loaded speaker terminals. Which means that, before I had even plugged this box into the mains, I already felt ‘let down’ and disappointed. For me the equation runs thus: Electrocompaniet = quality. Not this. Whenever I see spring-loaded terminals I’m reminded of those cheap and cheerful modern-day ghetto blasters that you can pick up from PC World that provide too much chrome-plated plastic, offer features with the word ‘mega’ repeated frequently and that try to compensate for poor sound quality with flashing lights and muscular plastic mouldings. They use spring loaded terminals. Not Electrocompaniet, surely. Yes they do and, in a way, that is just more fuel for my ire (although the Sonos examples look better in terms of quality). 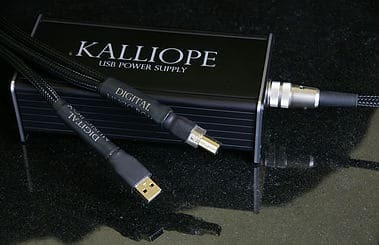 If Electrocompaniet is about to stick spring-loaded speaker cables onto its products then why not release this gear under another name which would also remove the pressure from people like me? A new name would create its own standards and expectations from a lifestyle stand-point. Don’t waste the good will built from the Electrocompaniet brand and dash my and others expectations to boot. Even in practical terms I cannot, for example, plug in my favourite low cost audiophile cables into these things. I have to have unterminated wiring. Yes, I can go out and buy unterminated, good quality cables (hmm, an additional outlay) but even then it’s still relatively limiting and the entire raison d’être of these spring loaded things follows a three-stage mantra: low cost, low expectation, low performance. If Electrocompaniet had budget issues and could not afford better speaker connectors for the SA-1 then why not go Wi-Fi only? Why not ‘do an Apple’ and just dump the feature entirely? After all, on the top of the box it says ‘wireless audio streamer’. We should either have an ‘Electrocompaniet’ branded chassis sporting audiophile components or, alternatively, an ‘EC Living’-branded chassis with these spring-loaded terminals et al and we can make up our own minds from that point. As it stands, this is a marketing blunder that could actually harm sales. I hoped the sound quality wouldn’t also be as confused. I hooked up a pair of speakers and began by pushing Marvin Gaye’s Mercy Mercy Me through an iPhone 8 via AirPlay. Some users seem to see streaming as a standard that avoids or side-steps the usual sonic quality laws in terms of playback. It does not. There’s a reason why, for example, the Rena SA-1 is priced over £2,000 cheaper than the recently reviewed streaming-friendly Leema Quasar, for example. Don’t expect the same level of performance. See the SA-1 as a lifestyle streamer occupying around the same market niche as the Sonos, for example and you won’t go far wrong. So yes, the dynamic reach of the Rena SA-1 has its limitations, the soundstage is a little restricted and the lower frequencies are rather muddy but this is largely to be expected for an all-in-one unit at this price point. There is still plenty to like here and the SA-1 provides a very creditable and admirable overall sonic performance. Upper bass reacted well, offering a rather bouncy bass guitar effect that gave the track impetus and drive while the secondary percussion was relatively insightful and clear. Gaye’s vocal was also largely smooth and presentable. I then accessed BBC Radio 3 via the Internet radio at 128kbps which, despite the low resolution, was pleasantly smooth without harshness or stridency in the upper mids and treble. Violins had an easy flow but with an element of texture to provide personality while wind instruments presented an element of fragility and purity, comparative to the lower resolution stream. Even the gamut of audience coughs after a musical pause were suitably enriched with reverb! I then switched to Spotify and listened to Can’s Little Star of Bethlehem from Delay 1968. Sonics exhibited a noticeable improvement in quality here. There may have been a lack of depth around the stereo image but the soundstage did give the ear the benefit of a more complex vertical layering with greater weight and impact in the lower frequencies, offering a firmer foundation for the entire track plus superior degree of separation between the lead vocal and backing instruments. Of course, we’re also talking above about streaming via lossy files – not the best sound sources in the world. I allowed the SA-1 to spread its wings a tad and plugged a USB drive into the rear of the unit, firing up a slice of jazz via Sonny Rollins’ St Thomas at 24bit/96kHz. As you might expect, sound quality took a leap upwards. Bass was a little bloomy at higher volumes but lower frequency detail was always ‘visible’ to the ear, giving the track a certain traction. The mids would’ve benefitted from a lower noise presentation but Rollins’ sax did reveal enough emotion along with a percussive drive and a persistent piano to drag you into the centre of the action, offering a musicality that might have lacked a certain accuracy but did entertain, nevertheless. To produce a good looking, multi-functional, low footprint streamer stuffed with an amplifier is a tough task and one that many companies would steer away from. The SA-1 might position itself closer to the lifestyle market than the audiophile sector but Electrocompaniet has done well to not only produce a great looking chassis and heaps of useful features but also an admirable level of sound quality for the price and the technologies involved. Easy to use, this all in one product provides great value for money. 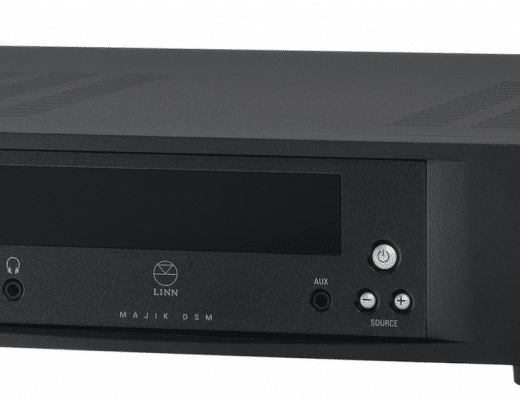 Linn Majik DSM: All Together Now…! thanks a lot for the article, really useful. I would really like your opinion on this. Hi Simon – not a problem. What opinion would you like exactly? You mean over and above the review I posted? Have You tried? And if Yes with wich result? You can have my opinion if you like Tropie? 🙂 I’d say no, I wouldn’t go there. Can I ask what you’re wanting to achieve with this configuration? What’s the aim?